The Stone of Destiny on the Hill of Tara has been horribly vandalized again! 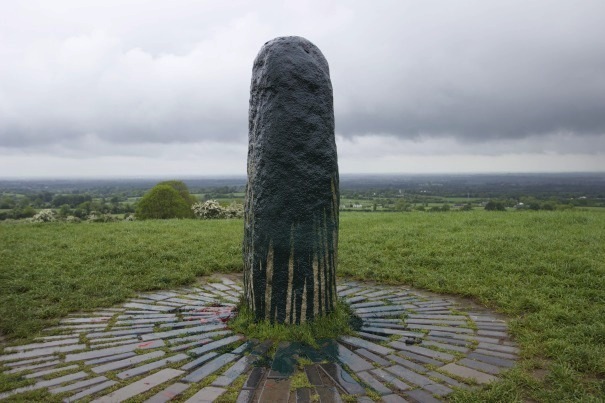 A few years ago it was attacked with a hammer and this time someone threw tins of red and black gloss paint over the ancient standing stone on the Hill Of Tara. 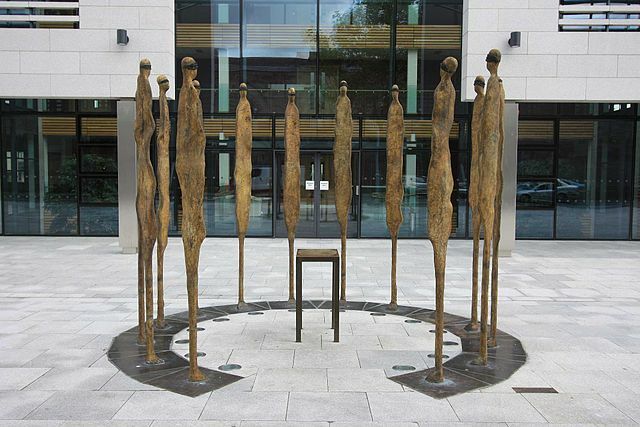 It is a stone long believed to have been essential in ancient king-making rituals in Ireland. This is such sad news. A spot so important and mystical should be sacred to all – no matter what religious or skeptical code you live by. Obviously, this person or persons not only doesn’t care about lore and history, but they have no respect for the land either. It breaks my heart. This type of destruction is becoming all too common at the historical sites in Ireland. It needs to be stopped. I hope that the stone can be repaired without further damage and that the vandal is caught quickly. What horrible news. In case you don’t know about the Stone here’s a brief history.. The stone had to accept the King of Ireland, much like the Arthurian legend – minus the sword. When the rightful king placed his foot on the stone it is said to have called out his name, declaring him High King of Ireland. It was said to have originally been positioned next to the Mound of the Hostages, the Neolithic passage tomb at Tara, and was moved to its current position on top of the Forradh in 1824 in commemoration of the 1798 Rebellion. If anyone knows anything about this most recent act of vandalism, please please please let the authorities know. Or if you were on the Hill of Tara or in the general area, between 5pm yesterday evening and 10am this morning and if you saw anything out of the ordinary or suspicious please do get in touch with Navan Garda Station on 046-9079930. Here in the U.S. Memorial Day means a three day weekend to most people. Many either forget, are opposed or are simply untouched by the idea of war and those who fight them. As a woman who is obsessed with the politics of another land and disagrees almost entirely with her own country’s foreign policy, Memorial Day is a strange one. Still, while I am opposed to war and I despise the greed from which almost all of them spring, I do not oppose those who fight them. I absolutely hate the fact that they are necessary – but I do not hate them. And I can hardly honor the patriot dead of one country without honoring my own, so here it is. Those who are sent on a mission and who do not return should be honored, not just on Memorial Day but every day. Those lucky enough to come back should be cherished and cared for – and those who thrust them into the world should be forced to join them, in order to better understand what they’ve done. Cheers to you…. and thank you for your service. May you never be forgotten. 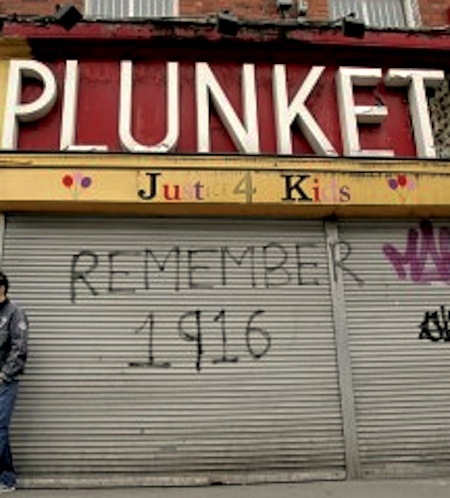 Today marks the end of the anniversaries of the 1916 Executions. James Connelly was shot May 12th, 1916. He was carried into the prison yard and tied to a chair, due to injuries that would have killed him in a day or 2 anyway. Instead of letting nature take its course, they tied him to a chair and the firing squad shot him. 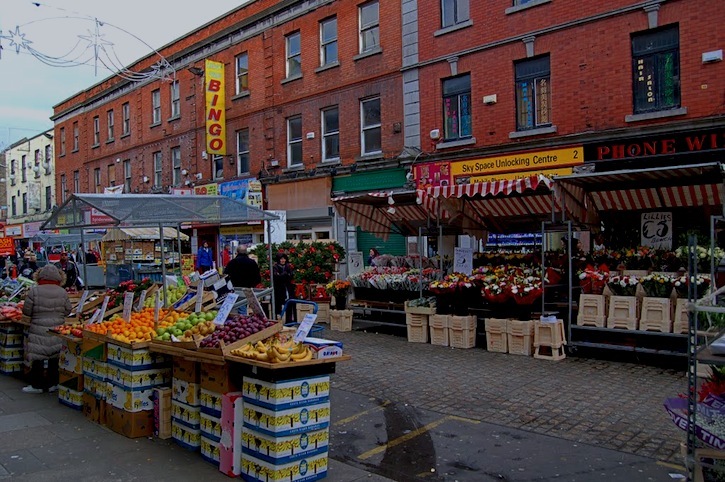 Last winter, a Sinn Fein guide mentioned rumors that he was already dead when they brought him into the yard, which was the first I had heard of the possibility. It wouldn’t surprise me – after all, they were only posturing and proving a point by executing him, despite his feebleness and injuries. Either way, the 12th marks the anniversary of his death – and this photo was taken in December at the mass grave site in Arbour Hill. I quite like the leaves in the cracks – and while I sat at the grave, a feral tabby cat jumped right into my lap and started purring like mad, at just the perfect time. 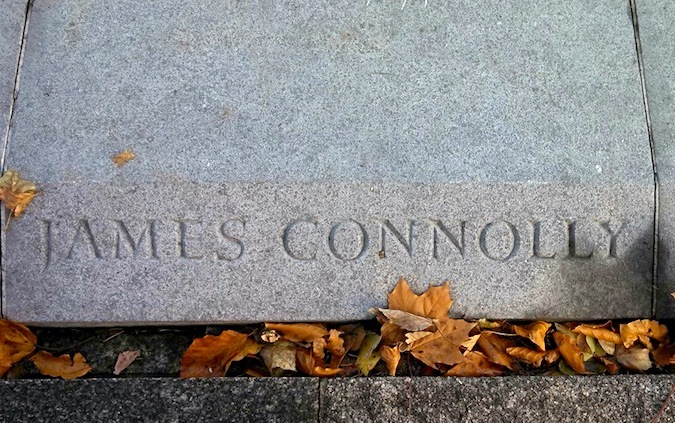 Rest in Peace Mr. Connolly and all of your cohorts too.